In the past, I have asked a question on this exchange regarding driving a well-maintained car across the East Coast of the U.S. In that particular question, I wanted to know if it were safe for a car to drive those distances in such a short period (turns out it is actually optimal). Now, I wonder whether or not it will be safe for me, not only my vehicle. I have virtually no experience driving in wintry conditions. I've lived in snow when I was younger. I know how to prepare myself for it, but I do not know how to prepare or maintain a car in it, nor how to travel potentially long distances through it. The trip from FL to NY (Buffalo) is about ~1.3k miles (~2k km), where, by mid-December, I think it would be reasonable to expect icy conditions on more or less half the length of the route. I have twice the experience driving the distance, not any for the conditions. As a virgin to driving long distances in such conditions, as a vehicle owner and operator, what are the more important notes one should regard when doing this thing? There are potentially endless notes one could make on such a topic, so for "more important," I mean things which most who have experience with these matters would agree upon, things of common knowledge/conventional wisdom/norms. We are very spoiled, at times when it comes to driving in the US. But for someone that is not used to driving here, winter conditions can be absolutely deadly. Take a look at http://icyroadsafety.com/fatalitystats.shtml It has some useful, though generalized, and older info, but from experience, I can tell you that the biggest risk for winter driving is people that are not used to winter driving. If you're not used to it, or not used to driving here in the US. then you are at a greater risk. That said information is your friend and can help mitigate the risks. You ask good questions, and I will provide tips. Keep in mind these are December tips. They don't hold true in the summer. Once in Georga or further north, the risk of ice and snow is greater. The colder the weather, the greater the risk. Of very high importance is ice on bridges. And some of the bridges are very long. Ice can form on bridges in whether that is in the 40s and 50s. The wind can cool the water on the bridge to freezing temperatures long before the ambient air temperature reaches freezing. 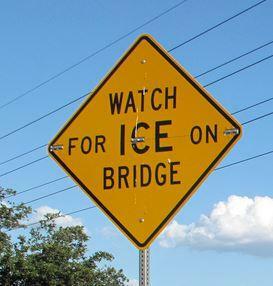 If you see a sign like this be aware they may be ice. "Black Ice" is a real problem. You generally can't see it. Never drive in the rain or snow if you're not experienced. Plan for getting "stuck" somewhere. It may seem silly, but it's worth it during the actual rain or snow. Rain is actually a bigger risk than snow. Snow leaves this powder you can see, rain has a higher tendency to leave ice patches that you can't see. Keep in mind, especially through mountain regions, that ice can form on the road long before the air temperature is freezing. Now for some prep work to keep you safe. Go slower. Both in speed and in general. Take your time. Bring very warm clothes even if it's not that cold. Winter weather is more unpredictable, and especially in the mountains can change drastically as you drive. It may be 80 in Florida and below freezing along the way, with your destination in the 40s. I see that a lot. Bring extra blankets, coats, and clothes just for the car. 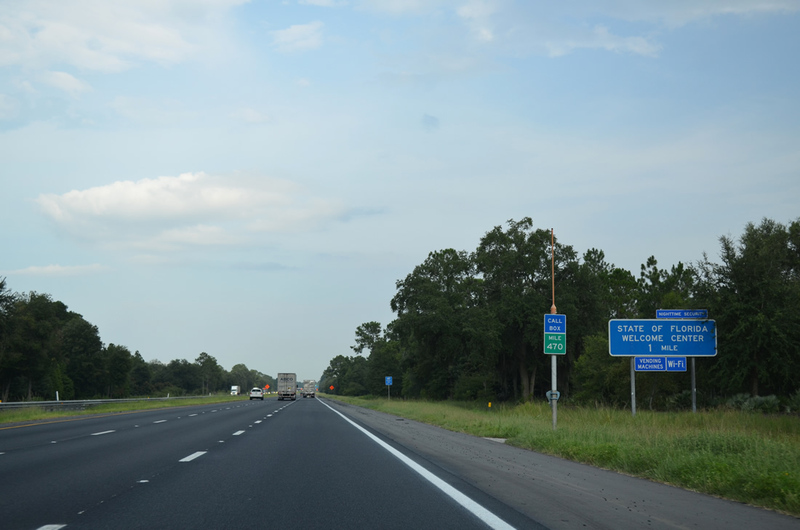 Be Exceptionally careful transitioning from the interstate to other roads. Interstates are usually addressed as soon as the weather permits, sometimes even in the storm. The side roads are a much lower priority. Sometimes not getting cared for until days or weeks later. Choose stops that are larger. Rest areas are good, truck stops are good. Large gas stations (that you can see from the interstate are good). Small gas stations are worse. The larger the location the better chance winter-related issues are addressed. Be aware, before you travel for the day, what kind of whether you're getting into. If the weather changes then be ready to stop. That may mean stopping for the day (or even two) when you don't plan to. Which brings us to.. Stop at state welcome centers. Find out if there is a number to call if you get into trouble. Every state that I am aware of will have a number you can call, or call boxes. The idea is that if your break down, or get into a minor accident, you call that number and they dispatch help. Keep your cell phone charged, and a phone charger in the car. Keep track of where you are using mile markers. If you break down, especially in some rural areas, there may not be a landmark that both you and the person on the phone can recognize. Mile markers fix that. It's much better to search a mile (some states use tenths of miles) then half a state. DO NOT CALL 911!!!!! Usually, that's the correct number, and if you can't think of anything else then it will do. But it's much faster to call the aid number you got at the welcome center. Your cell phone, while traveling, may not connect you to a local 911 operator. They will get you to the right person, but for non-emergencies, you could face fines. For emergencies, you may face long wait times as the dispatcher in some small town tries to find the right jurisdiction to hand your issue off to. Keep in mind that 911 service is based on where your cell phone bill goes, then where the tower your cell phone is talking to is. That may not always we close to where you are. Again, this is especially important in the mountains and rural areas. STAY BY THE CAR!!!!! If you have to walk to a call box leave a note and a direction you started walking. Especially if it's cold, really be sure you don't have an option. Most states have "Road Rangers" that drive the interstates at intervals looking for cars in distress. That is another thing you can ask about at the welcome centers. Dress warmly before you need to, it's better to stay warm than to have to warm up. Don't use your car's heater for warmth. That's a good way to make a bad situation worse. If it's evening or night time, deploy the road flares. All this negative may make it seem like it's all "Mad Max" in the winter and it's not. It's all relatively safe, but if you don't know what you're doing, you can get into some serious trouble. This is mostly true for travelers from different countries or people that are not used to driving in the US. If you're a US taught driver then truck stops, gas stations, mile markers, and call boxes are like second nature. If you have never dealt with those things they can be a source of much confusion. For all the naysayers that I am sure that will pop-up, please keep in mind that drivers from other countries see us as weird. I have had friends from European countries come over and expect to drive from one side of the country to the other in a few hours (because they can at home) or look me square in the eye and ask what a cup holder is for because their cars don't have them. I was once told that when they drive the activity is driving, and something like a cup holder or a drink is a distraction. Here (in the US) driving is something we do as matter of course. As is long distance driving. Same is true for a young or inexperienced driver that has never left a city. The routes you mention are major freeways, and they will be plowed and salted if need be for snow. Snow is not a common occurrence on most of your intended route, and ice will be an issue only if you are quite unlucky and travel during a storm or shortly after. A few days every year, and sometimes zero. I have been on the New Jersey Turnpike during moderate snowfall. Traffic was still moving at 30 mph. You might have an issue on city streets as you approach your destination. Having said that, at the time of this writing, the drive you intend is impossible today because of flooding. Winter travel is much less predictable. It's not possible to give a blanket statement. In general, travel on an interstate highway is just as easy in the winter as at other times, except that severe weather may be a bit more common, and the effects may last a bit longer. Icy driving is possible, but not to be expected even in winter. Icy conditions are very uncommon on the southern part of your route, even in the middle of winter. I would want to have an idea ahead of time of what to do in case of severe winter weather. Say that you find just before you begin that New York is forecast to have a severe blizzard prior about the time of your planned arrival. Would you be able to stay in Florida a few extra days and arrive later after it clears? Would you be able to drive part way and stay in a hotel for a few days until the weather clears? Could you leave early if it would mean arriving ahead of the weather? Know how to check road conditions. Most (all?) states have a web site with a transportation department that lists travel advisories and road closures. Have an idea ahead of time of what you'll do if weather makes your original timeline difficult. You almost-certainly will not see ice or snow on this route until past New York City unless you literally drive during a snow storm, which would be rare for that time of year, or if you drive immediately after a large snow storm, which would be rarer still. Those are low-lying coastal areas that don’t experience a lot of ice and snow in general, your time of year is too early for it anyway, and your route is large, major, heavily-traveled interstates that will be taken care of as soon as conditions permit. And heavy use itself can keep roads warmer than the surroundings, preventing much in the way of accumulation. Once past New York City, at some point you have to head into the Catskills and Adirondacks. You’re talking about higher elevations and somewhat less-used roads. The odds are higher there—though still not very high at that time of year. And as you get farther west—towards the Great Lakes—annual snowfall can get quite extreme due to the lake effect, though Buffalo doesn’t get the worst of that. But again, mid-December is not the height of winter, and snowfall at that stage is unlikely to be too significant. Anyway, the best advice I have for driving in snow is to only do one thing at a time: if you are braking, you are not turning, and if you are turning, you are not braking (you may in fact need to lightly accelerate to get proper traction). That does a lot to maintain control, and that mindset helps a great deal, because when coming up on a turn, you know you have to start slowing down well ahead of the turn because you want to be at the appropriate speed when you start turning, which is good practice. If you do spin out, you need to turn into the spin, which is counter-intuitive so spend some time thinking about what that means, how you do it, and why it works—I’m sure there are YouTube videos demonstrating it and explaining it. Understanding it can make you more likely to actually believe it and do it in a stressful situation. The chances for wintry conditions have already been discussed. Now, for driving in cold and/or snowy conditions… Make sure that you have winter tyres, or at least new all-weather tyres. They say that winter tyres have better traction than summer tyres at temperatures below about 7°C. It is possible that your car has traction control which reduces the acceleration; it most likely has an anti-skid system anyway. Otherwise, you'd have to drive more carfully, considering that your braking distance would be way higher. Carefully brake and accelerate, just to avoid slipping. Also do not make abrupt turns. With that, you should be pretty safe. Schedule your timing so that you're not going over the mountains (tennesee, kentucky) at night. Big rigs know the roads, and you don't! For several years I used to drive from Ottawa to New York city, in time for New Year's Eve. The American border seemed to me approximately where the permanent snow-cover ended (i.e. there is snow on the ground sometimes, but only after a storm). I agree with the comments though, about Buffalo: driving to Pennsylvania I got the impression that Buffalo is (like the Golden Horseshoe) still more-or-less within the snow-line, i.e. likely to feel (and look) like winter driving -- snow-banks visible by the side of the road, and the road surface visible because (or if) it has been ploughed and salted. To prepare the car you might want winter tyres. I think you won't want chains (I've never used them myself) except on unploughed private roads (and, maybe, mountain passes). You may want winterized liquids: antifreeze in the windshield-washer for sure. I think the manufacturers blend different kinds of gas (fuel) for different countries/climates, but maybe that's not an issue unless the temperatures are really low (a long way below freezing). I don't know about other fluids (oil and coolant) -- I guess a mechanic would know. For driving, take it easy: accelerate gently and brake gently. Use engine braking (if you have manual transmission) to avoid a skid, and/or modern ABS (anti-lock brake systems) might help. Also wear your seat belt of course, and allow for longer stopping distance, i.e. more room between you and the car in front. If the surface is snowy or icy then prepare to be surprised. The local city news always has stories of "fender-benders" when it snows -- if conditions are so bad that you might lose control, at least drive slowly. The most dangerous form of ice is invisible -- transparent, or under a layer of snow. When I was learning to drive, taking driving lessons in Ottawa, the instructor told me (I don't even know if they were joking) that I ought to hope there was a blizzard on the day of my driving test. They said that, if there was a blizzard, the test would consist of their asking me to drive once around the block, and that I'd pass the test as long as I didn't move out of second gear doing that. We're advised to carry (in the car) cold weather gear. Imagine, if you will, that you're stuck in your car for 24 hours with the engine off, waiting for rescue. So, real winter clothing (gloves, coat, hat, long underwear) and/or a sleeping bag. Also (to fully-equip the car) get an ice-scraper. That's like a small hand-spade or trowel with a stiff plastic blade about four inches square. You use it to scrape frost off the windshield (and off all other windows) before you start. You may also want a snow-brush (if it snows when you're parked), that's a brush about 3 feet long -- use it to brush snow off the front hood (so it doesn't fly up into the windscreen when you drive), and off the roof (so it doesn't fly off into the windscreen of the car behind you), and off your outside mirrors. You might also want a real snow shovel (if a wheel gets stuck in a bank of snow, shovel the snow out from the around the wheels). To fully de-ice the windshield you may need to let the engine warm for a few minutes before you drive off, with the hot air (de-icer) set to blow upwards onto the inside of the windshield. The further north you go, the more likely there will be winter conditions. This means that the further north you go, the more prepared for them that these areas are. An inch of snow on a New York highway is nothing, but an inch of snow on a North Carolina highway might have it be shut down. Not only is this because the states differ in readiness, but also because the drivers differ in experience. Watch the weather, taking note if there is a surprise storm. This would be an indication to not drive that day. As far as conditions in December, I'd be surprised if you saw snow south of New York. Accidents do happen. We, in the Boston area, add blankets to our driving emergency kits. As a side, and if you're super worried, get an ice-scraper at a gas station. In the case that it snows overnight, this tool will help you scrape it off your car. Not the answer you're looking for? Browse other questions tagged usa driving solo-travel or ask your own question. What is the driving time in a car from Zamyn-Uud to Ulaanbaatar? How can a foreign tourist get auto insurance in California USA? How can I rent a high clearance vehicle in the US? Why are you not supposed to back up at American tollbooths?